Throughout my summer vacation, the words “vision” and “forward” echoed in my mind, urging me to strive toward my goals. My name is Zach Williams. 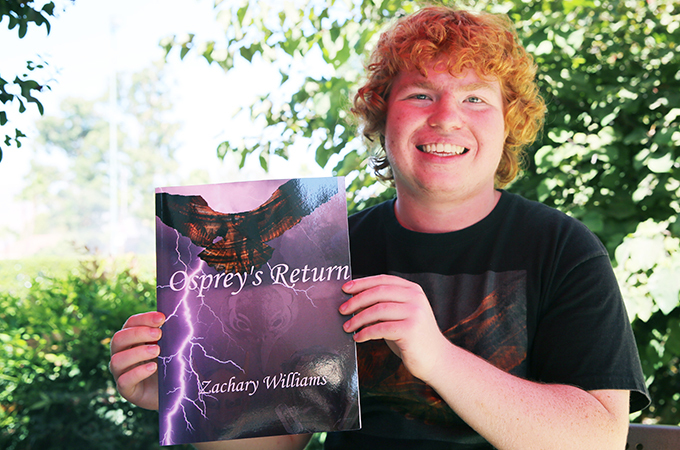 I'm a student at the University of Redlands and author of the novel Osprey: Justice Takes Flight, which I published about a year ago. Originally, I planned to relax on my summer break. What better way to celebrate finals being over than to play some video games? However, even though I took great pleasure in relaxing at home, something inside me wasn't satisfied. “I should be doing more,” I often said to myself. As much as I enjoyed playing games, there was still work that needed to be done. One topic that rang in my subconscious was writing my second novel. Although I had started a few chapters earlier in the year, I felt stuck. At that time, I honestly didn't know what I wanted the second book to be. I had a plot in mind, but the fine details were foggy. While I was able to write several chapters, usually one or two per week, I felt like I was standing still. I ultimately decided to put the second novel on hold in order to come up with ideas, then pick it up later. While I searched for answers, I began working with my dad, Leigh Williams, in his company, US-Defenders, and assisted him in building custom Land Rovers. The work could, at times, be difficult, as we regularly performed hard labor in 100+ degree heat, but I enjoyed the opportunity it gave me not only to learn, but also to let my imagination flourish. I wondered about characters and settings for the second novel, thought about various political topics, and pondered the mysteries of our world as I sanded down parts or handed my father tools he requested for the job at hand. Despite the grueling sticky heat and body-aching labor, I'm thankful I was given the opportunity to grow in body and spirit. After several weeks of helping my dad, it was abruptly August. Suddenly, I felt an enormous pressure weigh down on me. I still hadn't finished the second book and fall was drawing ever closer. Looking at the blank document on my computer screen, I began to grow frustrated. Instead of moving forward, I felt trapped in a bubble. I had remained in the same place while the world rushed past me. Thinking a break might restore my confidence, I decided to stay with my older brother, Mason, who lives about an hour away from my parents’ house, for the weekend. I found I could finally relax. Then, on the car ride home, my brain became charged with energy. A wave of inspiration filled me with hope and determination. In one moment, all the pieces I spent so long searching for suddenly fit together. The next day, I wrote with a vigor I hadn't felt in over a year. Four chapters were completed in one day, then two the following, then two more after that. In a rush of excitement, I continued to write. Finally, after a week of writing, editing, and cover creating I had completed my second novel. Osprey's Return, a dream I once thought impossible, was now a reality and joined its predecessor on Amazon. Throughout my summer vacation, I was able to learn about some of the most iconic off road vehicles with my father, while testing my endurance against the oppressive heat of the Lucerne Valley desert. I was able to spend time with my family, while pondering the wonders of the future. And, finally, I was able to finish a project I considered a lost cause. I am grateful for the opportunity—and for the two words that pushed my vision forward. Find your two words that push you to do great things!